INDIANA GLASS TIARA “AMBER SANDWICH GLASS BASKET”. 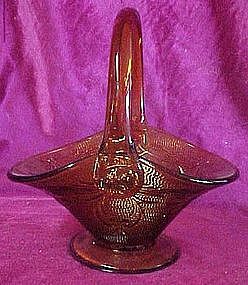 From the Tiara Glass collection Sandwich Amber pattern, the delicate curves of the sandwich glass make this 7 1/2" tall, 7” long and 5” wide basket a beautiful piece. It has what looks to be initials JD where the handle attaches to the body. Perfect condition with no damages.